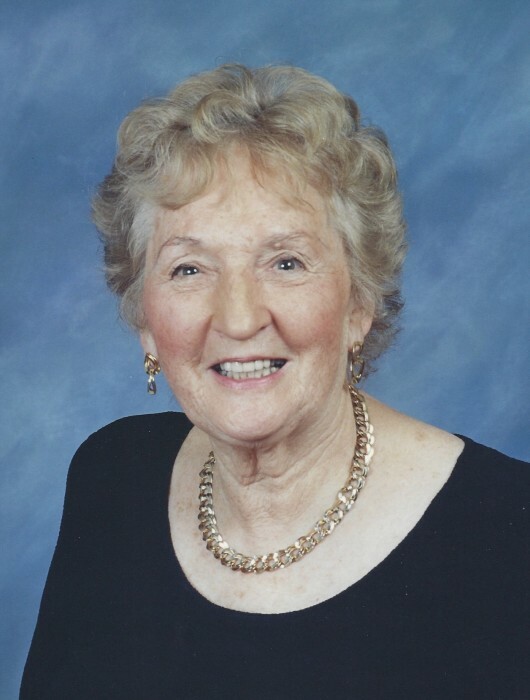 TYNGSBOROUGH – Patricia C. (Fallon) Wojcik, age 94, a resident of Tyngsborough and a former longtime resident of Lowell and Chelmsford, passed away at her home on Friday, November 9, 2018, with her loving family by her side. She was the wife of the late Edward J. Wojcik who died in 1999 and to whom she had been married for 39 years. Born in North Chelmsford, MA on October 16, 1924, she was a daughter of the late Joseph T. and Gertrude M. (Doyle) Fallon. Patricia was educated in the Chelmsford school system and attended Chelmsford High. After high school she worked for many years at Frosty’s Drug Store in North Chelmsford. In 1955 she met Eddie Wojcik at a Polish picnic and they married five years later. Pat and Eddie settled in Lowell, living on Bellevue Street for the next 29 years where they made life-long friends and raised their two children. Pat worked as a private home health aide for many families in the Lowell area, before retiring and moving to Bowers Avenue in Tyngsborough. It was there that she helped raise each of her five grandchildren, babysitting during their infant and toddler years while their parents were at work. Caring for her grandchildren was her greatest passion. She loved to entertain, hosting family holiday gatherings well into her 80s. She enjoyed cooking and visits from family and friends but most of all she loved being home and taking care of her family. Pat was an awesome and wonderful Mother, “Nana”, Aunt, neighbor, and friend who was loved and will be greatly missed by all who knew her. She is survived by a son, John J. Wojcik of Tyngsborough; a daughter and son in law; Lynne D. Barker and her husband Paul J. Barker of Tyngsborough; a former daughter in law, Priscilla Wojcik of Tyngsborough; five grandchildren, Benjamin D. Barker, Zachary E. Barker, Michael J. Wojcik, Jason C. Wojcik and Emily L. Wojcik; her furry companion, Comet; two sisters in law, Phyllis Wojcik of Chelmsford and Jane Powell of VA; also many beloved nieces and nephews and many dear friends. Mrs. Wojcik was a communicant of St. Mary Magdalen Church in Tyngsborough. She was also the sister of the late Robert Fallon, Edward Fallon, Pauline Crowell and Bertha Sadowski. WOJCIK – Patricia C. (Fallon) Wojcik. Relatives and friends will be received at the TYNGSBOROUGH FUNERAL HOME, 4 Cassaway Dr., Tyngsborough on Thursday morning from 8:30 to 11 a.m. Her Funeral Mass will be celebrated immediately following at 12 noon at St. Mary Magdalen Parish, 95 Lakeview Ave., Tyngsborough. Graveside services to follow in Fairview Cemetery, North Chelmsford. In lieu of flowers, donations may be made to the Lake Mascuppic Association, c/o Larry Clawson, 25 Mascuppic Trail, Tyngsborough, MA 01879. For online condolences or directions, please visit www.tyngsboroughfuneralhome.com.